What makes a person take a quest? Sometimes it comes from a monumental event that changes someone's life; and sometimes it comes from a passing remark. The latter is the spark that fueled my quest. At the age of 14 living on a ranch in Hanna, Utah, my thoughts were on daily chores and school. In the fall of my fourteenth year I was asked by my father to accompany my uncle to take the lambs to market. My uncle was easily influenced to take more than a few drinks when in town and my father needed me to make sure the sheep were taken care of. I was driving out from town because my uncle was unable to. It was an unpaved long and bumpy ride. My uncle was in a particularly foul mood and tole me "You'll never amount to a damn thing because your grandfather was an outlaw." I didn't pay a lot of attention to him at first. I asked my mom what he had meant by that statement. 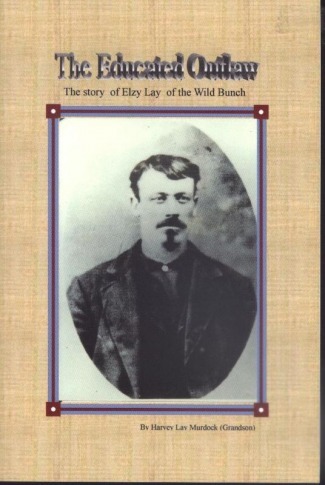 My mother told me that her father, my grandfather, was none other than the outlaw Elzy Lay who rode with the Wild Bunch and was close friends with Butch Cassidy. A passing remark from a grumpy man has led me on a 65 year quest to find out about my grandfather. I am fortunate enough to have talked personally with people acquainted with my grandfather and other members of the Wild Bunch. William Ellsworth Lay (Elzy) was born on the 25th of November 1868 in Mount Pleasant, Ohio. He died on the 10th of November 1934 in Glendale, California, just short of his 65th birthday. This is the story of my grandfather Elzy Lay. Paperback, 2009, viii, 84 p. : ill. ; 23 cm.